New 2013 White Mountain National Forest quarters dominated collectors’ attention, based on the latest U.S. Mint sales figures. 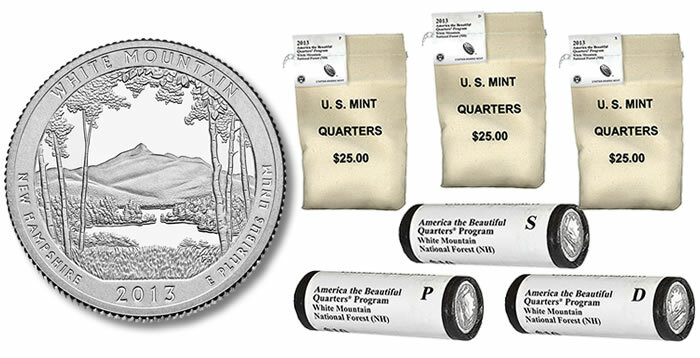 Six products with White Mountain quarters debuted on Jan. 28, 2013. They include bags and rolls of circulating-quality coins minted from Denver, Philadelphia and San Francisco with mint marks of ‘D’, ‘P’ and ‘S’. In unit totals, two-roll sets of P&D quarters were sought after most with sales of 24,429. Next were single rolls of S Mint White Mountain quarters at 3,909. The newly introduced three-roll sets filled with P, D and S quarters were right under at 3,385. Then the three 100-coin bags followed with S Mint coins at 2,761; P Mint coins at 2,141; and D Mint coins at 2,096. 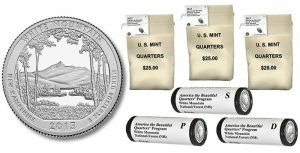 Aside from the bags and single rolls out of San Francisco, opening sales were solidly higher than earlier released products holding 2012 Denali National Park quarters. Competition from the new three-roll set could explain declines for these other two products. All six White Mountain quarter options showed up in the weekly list of best-selling U.S. Mint products. There have not been any new product sell-outs in the last seven days. Sales closed for the 2012 Mint Set back on the 28th. Its total increased 224 to 392,224, easily remaining the lowest since the uncirculated Mint Set from 1962. The latest sales figure could be the final one offered. The following grid provides the latest weekly and January sales for all U.S. Mint bullion products. The weekly period covers sales from Jan. 31 to Feb. 6, 2013. *American Eagle and American Buffalo total sales are only for calendar year 2013. The 5 oz. totals are for the coins sold by design and are all-time sales. **The Chickasaw sales total was adjusted down by -2,260 on Tuesday. On the previous Thursday (Jan. 31), its sales had trimmed by 40. Such negative adjustments are very atypical in U.S. Mint sales. The following tables provide the latest totals for US Mint numismatic clad, gold and silver coins as of Feb. 4, 2013.